We’re Looking for the Best Pet Gifts and Where to Find Them! 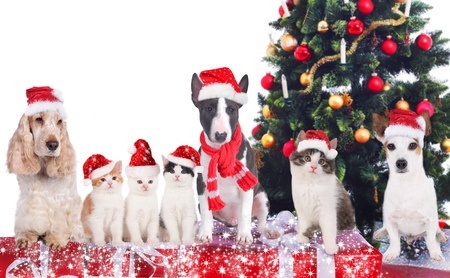 Just about everyone loves the holidays, including our pets. They can sense the excitement in the air, they’re visited by friends and relatives and they even get the occasional holiday treat in the form of a few tasty treats that they don’t get any other time of the year. If you’re like the millions of other pet parents who give holiday gifts to their furry best friends, you’re already thinking about what Santa might put under the Christmas tree for your pets. We’ve been compiling our list of the best pet gifts for Christmas, but have a few more weeks to try out some additional pet toys and even a few gifts for pet parents. If you know the best pet gifts for the holidays and where to find them, email us! We want to hear what you have to say, and we certainly don’t want to miss out on the perfect pet gifts for our dogs and cats. If you have a photo of your own pet or pets playing with a toy they really love or a treat they’ll do backflips for, send it. Your pet’s picture may be featured in an upcoming blog post at The Contemporary Pet! If you have a pet-oriented product or service that you’d like us to review in an upcoming blog post, please send us your website URL, information about your product or service, and how to contact you. While we can’t guarantee being included in our holiday gift guide for pets and pet owners, we always look forward to reviewing new products and services for our pets. Simply mail us at thecontemporarypet@yahoo.com.